Unlike other machine learning algorithms, convolutional neural networks are capable of automatically learning features from sequence data, support multiple-variate data, and can directly output a vector for multi-step forecasting. As such, one-dimensional CNNs have been demonstrated to perform well and even achieve state-of-the-art results on challenging sequence prediction problems. In this tutorial, you will discover how to develop 1D convolutional neural networks for multi-step time series forecasting. How to develop a CNN for multi-step time series forecasting model for univariate data. How to develop a multichannel multi-step time series forecasting model for multivariate data. How to develop a multi-headed multi-step time series forecasting model for multivariate data. Photo by Banalities, some rights reserved. This is where a model is required to make a one week prediction, then the actual data for that week is made available to the model so that it can be used as the basis for making a prediction on the subsequent week. This is both realistic for how the model may be used in practice and beneficial to the models, allowing them to make use of the best available data. The walk-forward validation approach to evaluating predictive models on this dataset is provided below, named evaluate_model(). The train and test datasets in standard-week format are provided to the function as arguments. An additional argument, n_input, is provided that is used to define the number of prior observations that the model will use as input in order to make a prediction. Two new functions are called: one to build a model from the training data called build_model() and another that uses the model to make forecasts for each new standard week, called forecast(). These will be covered in subsequent sections. We are working with neural networks and as such they are generally slow to train but fast to evaluate. This means that the preferred usage of the models is to build them once on historical data and to use them to forecast each step of the walk-forward validation. The models are static (i.e. not updated) during their evaluation. This is different to other models that are faster to train, where a model may be re-fit or updated each step of the walk-forward validation as new data is made available. With sufficient resources, it is possible to use neural networks this way, but we will not in this tutorial. The function below, named summarize_scores(), will display the performance of a model as a single line for easy comparison with other models. Convolutional Neural Network models, or CNNs for short, are a type of deep neural network that was developed for use with image data, such as handwriting recognition. They are proven very effective on challenging computer vision problems when trained at scale for tasks such as identifying and localizing objects in images and automatically describing the content of images. They are a model that are comprised of two main types of elements: convolutional layers and pooling layers. Convolutional layers read an input, such as a 2D image or a 1D signal using a kernel that reads in small segments at a time and steps across the entire input field. Each read results in an interpretation of the input that is projected onto a filter map and represents an interpretation of the input. Pooling layers take the feature map projections and distill them to the most essential elements, such as using a signal averaging or signal maximizing process. The convolution and pooling layers can be repeated at depth, providing multiple layers of abstraction of the input signals. The output of these networks is often one or more fully-connected layers that interpret what has been read and maps this internal representation to a class value. Convolutional neural networks can be used for multi-step time series forecasting. The convolutional layers can read sequences of input data and automatically extract features. The pooling layers can distill the extracted features and focus attention on the most salient elements. The fully connected layers can interpret the internal representation and output a vector representing multiple time steps. The key benefits of the approach are the automatic feature learning and the ability of the model to output a multi-step vector directly. CNNs can be used in either a recursive or direct forecast strategy, where the model makes one-step predictions and outputs are fed as inputs for subsequent predictions, and where one model is developed for each time step to be predicted. Alternately, CNNs can be used to predict the entire output sequence as a one-step prediction of the entire vector. This is a general benefit of feed-forward neural networks. An important secondary benefit of using CNNs is that they can support multiple 1D inputs in order to make a prediction. This is useful if the multi-step output sequence is a function of more than one input sequence. This can be achieved using two different model configurations. Multiple Input Channels. This is where each input sequence is read as a separate channel, like the different channels of an image (e.g. red, green and blue). Multiple Input Heads. This is where each input sequence is read by a different CNN sub-model and the internal representations are combined before being interpreted and used to make a prediction. A CNN for multi-step time series forecasting with univariate input data. A CNN for multi-step time series forecasting with multivariate input data via channels. 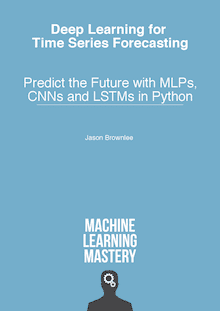 A CNN for multi-step time series forecasting with multivariate input data via submodels. We will not focus on the tuning of these models to achieve optimal performance; instead we will sill stop short at skillful models as compared to a naive forecast. The chosen structures and hyperparameters are chosen with a little trial and error. In this section, we will develop a convolutional neural network for multi-step time series forecasting using only the univariate sequence of daily power consumption. Given some number of prior days of total daily power consumption, predict the next standard week of daily power consumption. This is a good start. The data in this format would use the prior standard week to predict the next standard week. A problem is that 159 instances is not a lot for a neural network. This only impacts the training data, the test problem remains the same: predict the daily power consumption for the next standard week given the prior standard week. Next, we can define and fit the CNN model on the training data. We will use a model with one convolution layer with 16 filters and a kernel size of 3. This means that the input sequence of seven days will be read with a convolutional operation three time steps at a time and this operation will be performed 16 times. A pooling layer will reduce these feature maps by 1/4 their size before the internal representation is flattened to one long vector. This is then interpreted by a fully connected layer before the output layer predicts the next seven days in the sequence. We will use the mean squared error loss function as it is a good match for our chosen error metric of RMSE. We will use the efficient Adam implementation of stochastic gradient descent and fit the model for 20 epochs with a batch size of 4. The small batch size and the stochastic nature of the algorithm means that the same model will learn a slightly different mapping of inputs to outputs each time it is trained. This means results may vary when the model is evaluated. You can try running the model multiple times and calculating an average of model performance. Data must have this shape when making predictions for the test set and when a final model is being used to make predictions in the future. If you change the number of input days to 14, then the shape of the training data and the shape of new samples when making predictions must be changed accordingly to have 14 time steps. It is a modeling choice that you must carry forward when using the model. This means that we have the observations available for the prior week in order to predict the coming week. These are collected into an array of standard weeks, called history. Next, we need to retrieve the last seven days of daily total power consumed (feature number 0). We will parameterize as we did for the training data so that the number of prior days used as input by the model can be modified in the future. The forecast() function below implements this and takes as arguments the model fit on the training dataset, the history of data observed so far, and the number of inputs time steps expected by the model. That’s it; we now have everything we need to make multi-step time series forecasts with a CNN model on the daily total power consumed univariate dataset. We can see that in this case, the model was skillful as compared to a naive forecast, achieving an overall RMSE of about 404 kilowatts, less than 465 kilowatts achieved by a naive model. A plot of the daily RMSE is also created. The plot shows that perhaps Tuesdays and Fridays are easier days to forecast than the other days and that perhaps Saturday at the end of the standard week is the hardest day to forecast. Re-running the example with this change first prints a summary of the performance of the model. In this case, we can see a further drop in the overall RMSE, suggesting that further tuning of the input size and perhaps the kernel size of the model may result in better performance. Comparing the per-day RMSE scores, we see some are better and some are worse than using seventh inputs. This may suggest a benefit in using the two different sized inputs in some way, such as an ensemble of the two approaches or perhaps a single model (e.g. a multi-headed model) that reads the training data in different ways. In this section, we will update the CNN developed in the previous section to use each of the eight time series variables to predict the next standard week of daily total power consumption. We will do this by providing each one-dimensional time series to the model as a separate channel of input. The CNN will then use a separate kernel and read each input sequence onto a separate set of filter maps, essentially learning features from each input time series variable. This is helpful for those problems where the output sequence is some function of the observations at prior time steps from multiple different features, not just (or including) the feature being forecasted. It is unclear whether this is the case in the power consumption problem, but we can explore it nonetheless. We will use 14 days of prior observations across eight of the input variables as we did in the final section of the prior section that resulted in slightly better performance. Finally, the model used in the previous section does not perform well on this new framing of the problem. The increase in the amount of data requires a larger and more sophisticated model that is trained for longer. With a little trial and error, one model that performs well uses two convolutional layers with 32 filter maps followed by pooling, then another convolutional layer with 16 feature maps and pooling. The fully connected layer that interprets the features is increased to 100 nodes and the model is fit for 70 epochs with a batch size of 16 samples. The updated build_model() function that defines and fits the model on the training dataset is listed below. We now have all of the elements required to develop a multi-channel CNN for multivariate input data to make multi-step time series forecasts. We can see that in this case, the use of all eight input variables does result in another small drop in the overall RMSE score. For the daily RMSE scores, we do see that some are better and some are worse than the univariate CNN from the previous section. The final day, Saturday, remains a challenging day to forecast, and Friday an easy day to forecast. There may be some benefit in designing models to focus specifically on reducing the error of the harder to forecast days. It may be interesting to see if the variance across daily scores could be further reduced with a tuned model or perhaps an ensemble of multiple different models. It may also be interesting to compare the performance for a model that uses seven or even 21 days of input data to see if further gains can be made. We can further extend the CNN model to have a separate sub-CNN model or head for each input variable, which we can refer to as a multi-headed CNN model. This requires a modification to the preparation of the model, and in turn, modification to the preparation of the training and test datasets. Starting with the model, we must define a separate CNN model for each of the eight input variables. The configuration of the model, including the number of layers and their hyperparameters, were also modified to better suit the new approach. The new configuration is not optimal and was found with a little trial and error. The multi-headed model is specified using the more flexible functional API for defining Keras models. We can loop over each variable and create a sub-model that takes a one-dimensional sequence of 14 days of data and outputs a flat vector containing a summary of the learned features from the sequence. Each of these vectors can be merged via concatenation to make one very long vector that is then interpreted by some fully connected layers before a prediction is made. As we build up the submodels, we keep track of the input layers and flatten layers in lists. This is so that we can specify the inputs in the definition of the model object and use the list of flatten layers in the merge layer. When the model is used, it will require eight arrays as input: one for each of the submodels. This is required when training the model, when evaluating the model, and when making predictions with a final model. We can achieve this by creating a list of 3D arrays, where each 3D array contains [samples, timesteps, 1], with one feature. The updated build_model() function with these changes is listed below. When the model is built, a diagram of the structure of the model is created and saved to file. Note: the call to plot_model() requires that pygraphviz and pydot are installed. If this is a problem, you can comment out this line. The structure of the network looks as follows. Next, we can update the preparation of input samples when making a prediction for the test dataset. We must perform the same change, where an input array of [1, 14, 8] must be transformed into a list of eight 3D arrays each with [1, 14, 1]. The forecast() function with this change is listed below. We can tie all of this together; the complete example is listed below. We can see that in this case, the overall RMSE is skillful compared to a naive forecast, but with the chosen configuration may not perform better than the multi-channel model in the previous section. We can also see a different, more pronounced profile for the daily RMSE scores where perhaps Mon-Tue and Thu-Fri are easier for the model to predict than the other forecast days. These results may be useful when combined with another forecast model. It may be interesting to explore alternate methods in the architecture for merging the output of each sub-model. Size of Input. Explore more or fewer numbers of days used as input for the model, such as three days, 21 days, 30 days and more. Data Scaling. Explore whether data scaling, such as standardization and normalization, can be used to improve the performance of any of the CNN models. Learning Diagnostics. Use diagnostics such as learning curves for the train and validation loss and mean squared error to help tune the structure and hyperparameters of a CNN model. Vary Kernel Size. Combine the multichannel CNN with the multi-headed CNN and use a different kernel size for each head to see if this configuration can further improve performance. In this tutorial, you discovered how to develop 1D convolutional neural networks for multi-step time series forecasting. Hi Jason, thanks for the tutorial. One naive question: for last complete code, how to make prediction fixed / reproducible ? I tried “from numpy.random import seed” “seed(1)”, but the scores are still varied when running twice. Great article – thank you for the code examples. I really enjoy looking at your work since I’m trying to learn ML/DL. Question – what if I wanted to forecast out all of the variables separately rather than one total daily power consumption? This would be a multi-step multi-variate problem. I show how in my book. I would recommend treating it like a seq2seq problem and forecast n variables for each step in the output sequence. An encoder-decoder model would be appropriate with a CNN or LSTM input model. Thank you for the response Jason. Which one of your books are you referring to? Hi. When you increase the number of training example by overlapping your data, do you not run the risk of overfitting your model? You are essentially giving the model the same data multiple times. It may, this is why we are so reliant on the model validation method. Why do you want to use capsule networks? They seem fringe to me. Thank you – I have purchased your ebook. Thanks for your support Jim. For the multi channel model (using 8 inputs, with 2 convo layers pooling , 1 convo and pooling), you actually get an error when using n_input = 7. Do you have any idea? Negative dimension size caused by subtracting 3 from 1 for ‘conv1d_55/convolution/Conv2D’ (op: ‘Conv2D’) with input shapes: [?,1,1,32], [1,3,32,16]. Perhaps the configuration of the model requires change in concert with changes to the input? Thanks Jason, i believe that the feature map is too small for the layers, which resulted in the error. Also, one point to note is that my multi channel model is not doing as well as your example. (stochastic). However, it is actually doing worst than the single variable model with n_input = 21! In the first example with the univariate CNN in evaluate_model function you wrote “history = [x for x in train]”. Why? Shouldn’t be something like “history = [x for x in test]” since we want to evaluate the model? Yes, but we need input for the first prediction of the test set, which will/may come from the end of the training set. hi jason! how to download “household_power_consumption.zip” ? because when i click that, the website cannot be open. As my understanding, song classification is a case of Time Series data right? Can you write a topic about that? Hi Jason, as always great tutorial ! I had a question concerning the multi-head CNN, would it be a good idea to use different CNN architecture instead of using the same one ? It really depends on the problem. Perhaps try it and compare results. I noticed that loss was very high during training.Loss must approach 0 in some task. Ideally, but this is not always possible or even desirable if the model is overfitting. After normalizing features,loss approach 0. If normalizing features,how to invert scaling for actual and forecast in Walk-Forward Validation. I am very doubtful about this, especially the CNN model in this post. If you use sklearn to normalize, it offers an inverse_transform() function to returns data to the original scale. If you scale manually, you can write a manual function to invert the transform. Hi Jason, thanks for these examples. Do you see a difference between the results in using multi-channel vs multi-head CNN for multi-variate data? What is your recommendation on using these 2 different approaches? Try both, see work works for you. I like multi-head with multi-channel so that I can use different kernel sizes on the same data – much like a resnet type design. Hi Jason, do you have any recommendations on when multi-channel and when multi-head approach would be better? I recommend using multi-channel and compare it to multichannel on multi-heads to allow the use of different kernel sizes. Can you provide link of code how time series data can be converted to image form for input to CNN? Anf how to convert in 2D? Sorry, I don’t have an example of this. There is no need, a 1D CNN can operate on the data directly and performs very well! Thank you for this tutorial and for the book version as well. I tried to plot observations against predictions for a given time step with the date in the x-axis but couldn’t get it right. Could you please help with that. Thank you! Sorry, I don’t have the capacity to review and debug your code. Perhaps try posting your code and error to stackoverflow? I even provide a forecast function for you in the tutorial. Perhaps I still don’t understand the problem that you are having? Hi Jason, thank you so much for your tutorial. it helped me a lot.. I have tried this code on my data (speed data during a sequence of time) and it works very well. However, i need to run Resnet on the same data, i have replaced the def ‘build_model’ by a residual block but it did not work. Please, have you idea what should i change in your code to have residual neural network ?? if you have already an example, it will be great.. Thanks a lot for your support. Thanks for the great tutorial! I wonder if the multivariate channel approach is applicable for high-dimensional data, e.g. for 100 variables that could effect the outcome? Yes, it might be effective. Try it and see? I am working on it but I get confused about the “history” you are using. I don’t get why you don’t just use the test data to predict y_hat_sequence. To me it seems like you append sample i of the test set to history (line 117 in the first 2 examples) and then you predict on the last 7 days of history, which is sample i of the test set. Please tell me where the error in reasoning is.. I am using walk-forward validation, which is a preferred approach for evaluating time series forecasting models. Hi.. I used 70/30 for train and test to predict forecast on my data using CNN. How can I predict day ahead or hour ahead prediction. Should I use walk forward validation? Walk forward validation is really only for evaluating a model. You fit the model on all available data and make a prediction via model.predict(). I am currently trying to apply the Multi-step Time Series Forecasting With a Univariate CNN and i am facing troubles with the batch size and input shapes. My data are very few at the moment, 30 days of 1440 timesteps each day of a sensor measurement . my goal is to predict another day , so another 1440 timesteps. The input_shape i am using is (30, 1440 , 1) so on the Conv1D layer i put on input_shape = (1440, 1). Then basically i followed your instructions on how to structure the rest of the network to see how it works but i get an error when i run it ( with any number of batch size). Is it something obvious that i am doing wrong? Should i use different shapes? Thank you in advance for your time and your extremely helpful tutorials i have used before. Apologies if it is something obsolete or something out of your knowledge. 953 # Prepare validation data. 788 check_batch_axis=False, # Don’t enforce the batch size. The error suggests a mismatch between the shape of your data and the expected shape of the model. You can reshape the data or change the expectation of the model. I’m coming from your tutorial on Multivariate, multi-step (e.g. 20 day loopback) time series forecasting using LSTM neural networks. I’d like to compare the LSTM results to the CNN results here. Do you mind explaining how I could use the reframed data from that example to apply to apply to this example here for daily prediction? You can use data with the same structure for evaluating RNNs and CNNs directly.